I was introduced to Laura Sullivan's exceptional music when I listened to and reviewed her music album Mystical America and fell in love with her musical genius. Her music is soothing, relaxing and so soulful that you cant help but feel moved by it. In her latest release, The Modern Romantic, she brings to us relaxing and musical piano compositions that held me entranced throughout. Each composition is unique and different from the others and had me feeling loose and miles away from the chaos of my daily life. This album contains music that suits its name, The Modern Romantic and will have you feeling the magic of romance in no time. 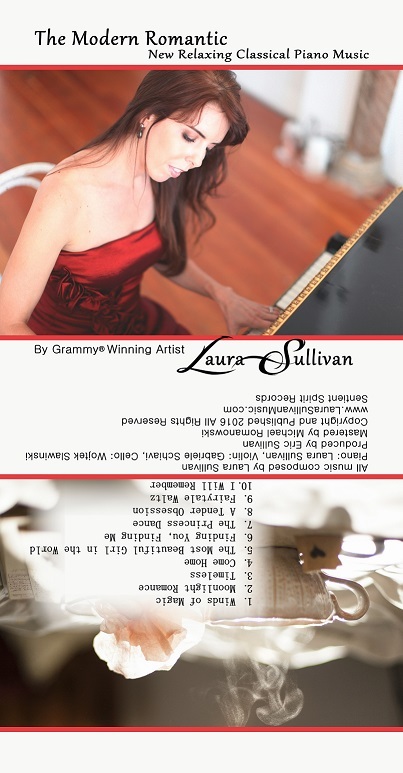 Calming, enchanting and promoting the holistic health of mind and body, The Modern Romantic is another memorable music album by Grammy Award winning artist, Laura Sullivan and one that I absolutely loved listening to. Strongly recommended to everyone from me, go buy and experience Laura's musical genius. 4.5 out of 5 to it from me and I look forward to listening to more music composed by Laura in the future. I received the music album from the composer to listen and share my honest review and I am very thankful to Laura Sullivan. The above is my unbiased and frank review that is not influenced in any way.